La Manga is a resort town and is located on the southern most tip of the Costa Blanca. Some argue that it is the start of the Costa Calida the warm coast. La Manga can easily be reached from the international airports of Alicante and Murcia. To get there use our La Manga map with driving directions. La Manga is ideally situated close to San Javier Murcia airport where many low-cost airlines such as Ryanair fly into or there is the option of flying into Alicante airport a little bit further north which is approximately 1 hours drive away from La Manga. One can easily get an airport transfer to La Manga or catch a taxi from the airport. 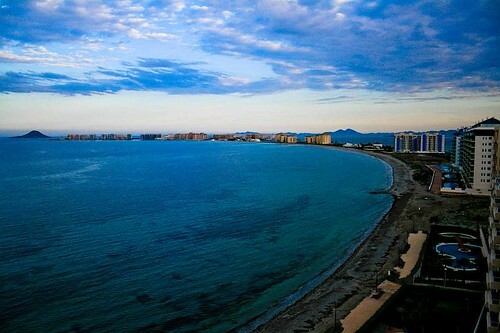 The La Manga strip is a strip of land nineteen kilometres long and one hundred meters wide is a “sleeve” of land which separates the Mar Menor from the Mediterranean Sea. It is cut off with natural channels which keep the two in contact with each other. This area was largely untouched until the 1960’s where then it began a massive transformation making it the tourist resort it is today with major infrastructure. This guide to La Manga is for people intending to visit or come to La Manga on holiday. We help visitors who are planning a trip with useful and practical advice on many tourism related subjects such as La Manga car hire, La Manga accommodation, sightseeing, weather, where to go, where to stay, travel information, excursions and what to see and do in and around La Manga. Most people know La Manga for the famous resort of La Manga Club but there are also many resorts and beaches in the area which you can see on the La Manga map such as Veneziola, El Oasis, Punta Seca, Villagrosa, Le Martinique, El Bolondo, Las Antillas, El Pedrucho, Jardin del Mar, Euromanga, El Galan, Montemares, Manga Beach, Acapulco, Bellavista, La Embestida, Pleamar, Los Alisios, Calnegre, Urmenor, El Vivero, La Manga del Mar Menor, Playa Paraiso, Playa Honda, Cabo de Palos and Rincon de la Goiera. La Manga weather enjoys a Mediterranean climate with long hot summers and mild winters with very little rainfall making it an all year resort. There are, apartment complexes, sailing ports, sailing schools, recreational centres, supermarkets and of course the famous La Manga Golf Course. La Manga also has many hotels, shops, bars, clubs and restaurants. One of the most popular areas with young peoples is the Zoco area. La Manga sure has the reputation of being a resort where you can relax, enjoy, spoil and pamper yourself at the Las Lomas Spa. The place to go on holiday has to be the La Manga Club set in 1500 acres of flowers and orchids, is great for families and offers sport academies for children like football, tennis, cricket, rugby and dancing as well as spa facilities. It even has its own private beach and restaurant at La Cala. Being located between the Mediterranean Sea and Mar Menor makes La Manga an ideal resort for water sports. There are sailing and water skiing schools as well as wind surfing and catamarans. There are a few dive shops and scuba diving centers in La Manga and many interesting spots along the coast to go scuba diving with sites like Isla Grossa and El Fallon Cabo de Palos, Isla Homigas Marine Reserve, making La Manga have some of the best diving on the Costa Calida. For accommodation in La Manga there are hotels such as The Cavanna Hotel and the Hotel Entremares, apartments, villas, guesthouses, hostels, pensions and camping sites in the La Manga area. For eating-out and dining out La Manga has many good restaurants, bars and cafes such as the Restaurante El Parador del Mar Menor, Restaurante Paquebote, Pizzeria Di Mare and the Restaurante La Tana. La Manga has much to offer the discerning holiday-maker. Whether you’re looking for a place to rent or to stay at permanently, you can take advantage of the services from the real estate agents in La Manga who are more than willing to help you in finding your ideal residence. You can contact Casas & Houses (www.casas-houses.com, Tel. +34 968 145 656) and Arena Inn (www.arenainn.es, Tel. +34 968 140 781). La Manga Guide – Page Summary – This page contains unique content about the tourist resort of La Manga in Spain. Please help us to make this the number one tourist resource for La Manga by adding any comments, reviews, ratings and feedback on La Manga that you know about. We also welcome your photos, pictures and videos of La Manga for posting on our website. I’m an American, caddie on the Web and LPGA tours. I am looking to make the jump to Europe. I hoping to move closer to the kids, in Belgium. Trying to find a second part time caddie or golf job. Anyone with a lead. Spain or Portugal.